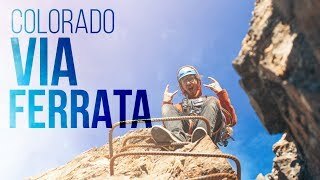 But seriously, what is a Via Ferrata? /vee-uh•fur-aht-ta/ n. A mountain route equipped with fixed ladders, cables, and bridges in order to be accessible to climbers and walkers. Get it? I’d be impressed if you did! A via ferrata is a way to traverse across and up a cliff-face by walking across iron bars that have been inserted into the rock face. Via Ferrata is an Italian term that literally means ‘iron road’. Via Ferratas trace back to the 19th century, however, they are most famously known for their presence in World War I. Several Via Ferrata courses were built in the Italian Dolomite mountain region to help troops move throughout the rocky terrain. Fast forward a few years to when recreation-junkies caught wind of these protected climbing paths; There are now over 1,000 via ferratas in the world. You can find guided and unguided via ferrata courses across the globe, including North America, China, Africa, Iceland and more. Need a visual? Don’t worry, we got you! Just keep scrolling down to our video. You can join us on the cliffside in Idaho Springs, a historic mining town just 30 minutes from downtown Denver, on the Mount Evans Via Ferrata. This course is complete with a 50 foot free fall, 70 foot rappel and multiple suspended bridges situated 300 feet above Chicago Creek. You even get to do 3-lines of the Cliffside Zipline course, voted 2018’s Best Adventure Park of the Rockies by Elevation Outdoors! Head south to one of the whitewater wonders of the world to the town of Buena Vista, CO. This charming town is situated at the base of the towering 14,000+ foot Collegiate Peaks along the Arkansas River. The Granite Via Ferrata will have you living on the edge after you zipline to your starting point. You’ll ascend crags, and rappel above the Arkansas River Valley. AVA’s Via Ferrata tours are perfect for those looking for a new, active experience. Clear Creek is one of Colorado’s best destinations for whitewater rafting of all levels, and it flows right past the Via Ferrata. Choose from family friendly, adventurous or high intensity river trips for a full day of thrills. Afterwards, head into historic Idaho Springs for a bite to eat or a local microbrew to toast a fantastic day. The world-famous Arkansas River is combined with an incredible mountaineering excursion with these packages. The variety of whitewater rapids is large, leaving you to decide between mild and scenic stretches of river to some of the most difficult commercially rafted whitewater. Via Ferratas were first used during World War I as an alternative to rock climbing to scale a rock face. It may be an alternative to climbing, but you can expect to climb a bit during this tour. Most of the climbing will involve iron rungs mounted on the cliffs, making the route more accessible than a traditional rock climbing experience. You’ll still get to rappel down the cliffs just like a traditional rock climber. You’ll also receive a full orientation from your guides prior to venturing onto the Via Ferrata, so you’ll know exactly how to use your equipment. From iron rungs and hanging bridges to cliffside trails, you’ll have a wide variety of features to navigate over the course of these tours. Your friendly guides will help you through each section of the Via Ferrata while providing any assistance you might need and plenty of entertainment. We hope you are ready to push yourself to the edge, because both of these tours feature breathtaking free falls. You’ll walk out onto the bridge, hang your toes off the edge and step off. Feel the adrenaline rush of experiencing true free fall before our auto-belay system catches you and lowers you to the ground below. And not to worry, both Via Ferrata courses incorporate zipline into them as well so you won’t miss out on any aerial adventures. AVA provides all technical equipment for your tour, including a helmet, climbing harness, and the specially designed safety device that will anchor you to the cliff walls. You are responsible for bringing sturdy, closed-toed shoes and comfortable, athletic clothing. Be sure to check the weather forecast so you can bring additional layers or rain gear as needed. Sunscreen and sunglasses are also recommended.